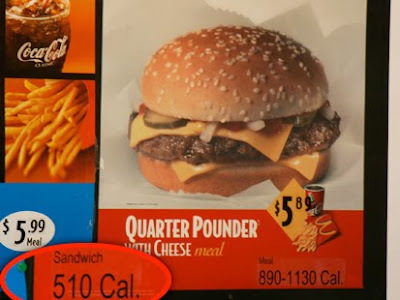 On July 18th, 2009 New York City's mandatory menu calorie law went into action and restaurants with 15 or more locations were forced to post calories on menu boards and/or menus for their patrons. The hope has always been that armed with this information people would choose fewer calories. Well, so far the results aren't too promising - at least not for a very specific population. In a paper published online in the journal Health Affairs, Brian Ebel and colleagues explored the purchasing behaviour of 1,156 adults at 4 different fast food locations in New York City. Researchers tracked purchases 2 weeks prior to the labeling law's implementation and 4 weeks after its implementation. Participants were told before purchasing that if they provided researchers with their receipt and answered a brief survey that they would receive $2. Prior studies using similar methodology for recruitment reported roughly 55% of restaurant goers participate. Researchers then used the receipts to determine the calories of the menu items ordered. The population studied was quite distinct. 85% were from minorities, and half had only a high school diploma or less education. The neighbourhoods were poor neighbourhoods and on average respondents reported that they frequented fast food restaurants an average of 5x weekly. What the researchers found was that for this sampling of poor, uneducated, fast-food addicted, minorities unless they specifically stated that they both noticed calories on the menu boards and changed their behaviours accordingly, calories consumed were the same both before and after the labeling law came into effect. Given the sample, these data are clearly not necessarily representative to the rest of the population. I would also expect that there will be far less change in caloric purchasing in fast food restaurants with fairly limited menus than in fast casual restaurants with more varied fare and patrons with more disposable income. Looking at McDonald's menu specifically, there really isn't much variety in calories in that even salads, when combined with dressings, tend to have calories comparable to their burgers. Furthermore given the nature of the sample and the recruitment I wonder whether or not they selected for the poorest of these poor patrons who actually would bother taking time out of the middle of their weekday for $2. The authors also admit that because the study took place so soon after the law went into effect perhaps they hadn't had enough exposure to have the numbers sink in. Personally I suspect that the exposure that truly would be necessary wouldn't be the actual calories on the menu boards but rather exposure to education as to just how many calories the body needs per day and in fact there have been studies that suggest menu labeling works far better when combined with that type of information. At the end of the day what this study tells me is that cost matters to this group far more than calories, and pragmatically I don't blame them one bit. It also impresses upon me the real need of finding innovative means to provide affordable, healthy food for the poorly educated and impoverished. So should we shelve these initiatives? Of course not, though it will certainly make the results from the much larger sampling of 12,000 receipts being collected by the public health department of New York that much more interesting. It's still a hill I'd be willing to die on.